Scale Labels - CAS CorpCAS scale labels are available. Pre-printed designs are available in various sizes for standard UPC printing, safe-handling instructions, bakery, and more. LST-8000, LST-8010, and LST-8020 are popular choices for LP1000, CL5000 and LP-II scales. 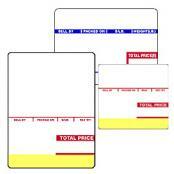 Scale Labels - IshidaIshida scale labels are available. Print professional labels with ease. Pre-printed designs are available in various sizes for standard UPC printing, safe-handling instructions, bakery, and more. We have decades of experience providing customers with label printing scales and related equipment. A good, high quality roll of labels is mandatory for these scales in the food service industry. 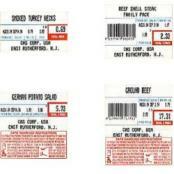 We have many different types and sizes of labels including Safe Handling Instruction Labels, Ingredient, UPC Barcode etc. Although we specialize in CAS and Ishida labels, we do have a wide variety of other brands available including Berkel, Bizerba, Digi, Global, Hobart, Kubota, TEC, Toledo and Weldotron. Call us at (919) 776-7737 for a price quote and availability.